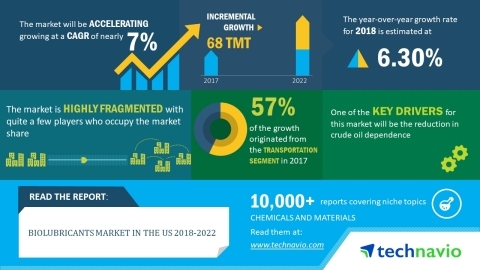 Technavio analysts forecast the biolubricants market in the US to grow at a CAGR of nearly 7% during the forecast period, according to their latest market research report. The increase in demand from the defense industry is one of the major trends being witnessed in the biolubricants market in the US 2018-2022. Increase in aerospace and defense budget allocations, owing to the resurgence of global security threats in the US, can positively influence the market. Plant-based biolubricants are increasing in popularity as they offer environmental benefits and have a low carbon content. The biolubricants market in the US research report provides market segmentation by product (plant-based and animal-based) and by end-user (transportation and industrial). It provides an in-depth analysis of the prominent factors influencing the market, including drivers, opportunities, trends, and industry-specific challenges. The transportation segment held the largest market share in 2017, accounting for nearly 57% of the market. This end-user segment is expected to dominate the global market throughout the forecast period.